Reading Andrzej Marczewski’s (@daverage) excellent and very engaging book “Even Ninja Monkeys Like to Play” has made me analyse more deeply how we try (and succeed or fail) to enhance learning design with elements of game design (#learningworlddesign). How do we gamify learner experiences and on what level do they connect to learners? How do we design learning worlds that incorporate the best and most relevant elements of game design? Based on Marczewski’s classification of game thinking I have endeavoured to develop a similar classification for Game thinking in learning design. The MDA framework (Hunicke, LeBlanc, Zubek, 2004) which introduces Aesthetics, Dynamics and Mechanics as three interconnected layers in games helped me analyse the design approach further. This blog post provides a quick examination of each classification and the start of my thoughts! The classification does not indicate any weight or value for each type of game thinking. E-learning courses that apply playful design bolt a gamey coat on top of ‘ordinary’ learning design. They have a fun appearance, or remind of existing games. This can be just an adaptation of look and feel: colourful, funky fonts, cartoonified avatars, or reminiscent of the art work of well-known games. Another playful coating can be the use of snappy dialogue, and well written scenarios or roleplay in classroom to teach skills. Free navigation, or the impression of free navigation via e.g. a central map or plan is another game inspired approach. Popular examples are also ‘playfully dressed up’ multiple choice quizzes – using quiz show templates like jeopardy or multi-millionaire, or e.g. making a balloon pop when a question is answered wrong. This type of playful design can also be found in non-digital form, where learners play board games which consist of rolling a dice and then answering classic multiple choice questions turn after turn. 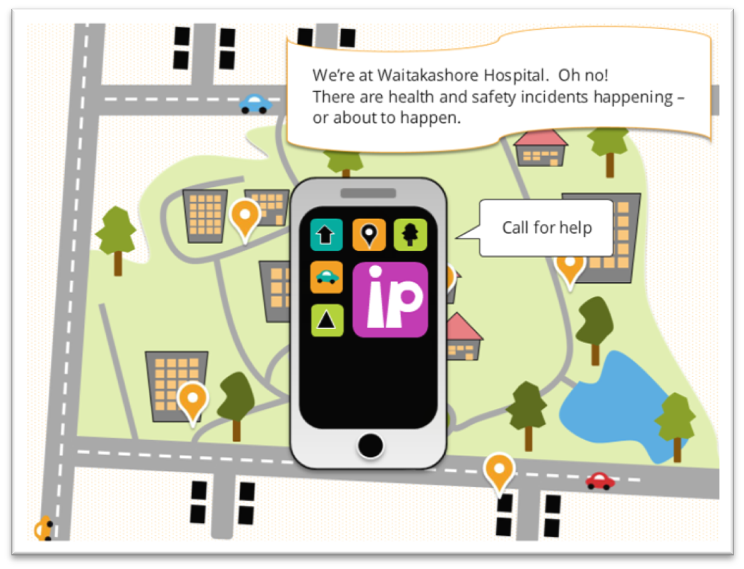 I created a Health and Safety course that answers this description exactly: the learner has to uncover problematic situations in a hospital, and accesses each scenario via a cartoonified map. It’s free navigation but all items have to be solved to end the course. The learner is also guided by a funky middle-aged superheroine who can be called by a colourful phone and provides snappy dialogue. The look, feel, and narrative of this course are playful and (according to user feedback) give life to a dreaded compliance subject, but it’s definitely not to be classified as a game or even gamified learning. Gamified learning can go two ways, which I have discussed in two previous blogs. Outer gamification will use the now almost classic badges, points and leaderboards. The use of these elements can actually be just a variation of playful design (e.g to indicate learner progress in a course). Meaningful use of badges and scores should correspond to mastering skills/learning insights identified in the training needs analysis, and not be attributed for unimportant achievements. That’s where these game design elements are useful to create gamified learning. The attribution of different types of scoring depending on the real-life importance of the content is a possible option to achieve this. As an example, in a scenario-based course on a medical subject wrong decisions could either bring down the score on technical knowledge or have the learner lose a ‘patient life’ if a really dangerous choice is made. A three strikes is out approach for ‘lives’ brings home the importance of certain actions and creates the ‘challenge’ pressure that games often provide (part of A in the MDA framework). A challenge can also be created by adding time pressure (countdown) but again, it needs to be related to the learning. If the learner needs to think quickly in real life about the timed actions presented in the learning, it is gamified learning. Inner gamification uses game techniques and mechanics to bring a course to life, to make a course more engaging for the learner. Storytelling (Narrative in the MDA framework) that goes beyond simple scenario-based quizzes, where you provide a learner path determined by decisions and consequences is shown in an example that has become a classic: Connect with Haji Kamal. Another example is Discovery (also part of A in the MDA framework): freely navigating an environment, trying to solve a challenge set for learning and where there is room to learn by failure. The screenshot here is part of a learning game I designed. 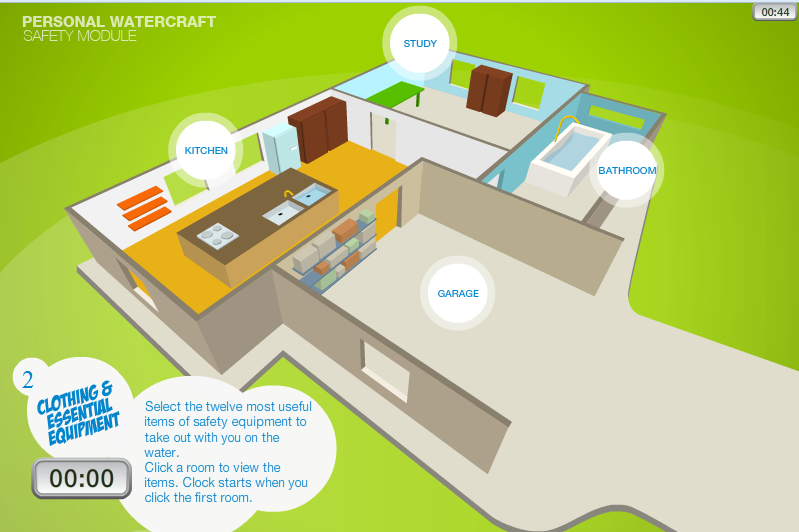 It shows a house plan, where the learner has to go through the rooms, discovering items that may or may not be essential to take on a boating trip. They have space for twelve items, but discovery provides a lot more options than that. Their chosen items then contribute to a score. The discovery is also under time pressure, underpinning the (realistic) narrative that you have to leave at a certain time because of the tides. Board games designed for learning can go from playful design (as explained above) to gamified learning in the same way as e-learning. A strong narrative, meaningful decision making, time pressure but also fellowship by forming meaningful strategic partnerships with other players are all options to enhance gameplay. Real educational games should be real games, full stop. They have to be able to attract players with no learning intent as well as the players who play for the learning. In short, it needs to be a good game as it is. In an almost sneaky way, though, it has a meaningful purpose, a measurable goal achieved through playing. Some basic design premises to achieve this were explained wonderfully by Jen Helms (@jenrhelms) in a very interesting blog post on Gamasutra. She states that to truly make a good educational game, you must discover the system behind the learning objectives, separate from content. You almost move the content to abstraction, strip out all unnecessary baggage. All your game mechanics attribute to this game learning mission. One of my favourite examples of a strong learning game is award winner DragonBox, a game that teaches algebra. The starting point is a scared little dragon in a box, that will only come out when it is alone and the player has to make that happen. This is such a beautiful narrative stripping it all back to the core system of equations in algebra, where ‘x’ has to be isolated with different techniques to solve the problem. The now infamous Plague Inc, where you have to make strategic decisions in order to make ‘your’ virus kill the world is another favourite. News items on the zika virus or ebola will have so much more impact on you after you have played Plague and understood ‘the system’. The game is now also available in board game format, which must also be exciting to play, as you will play others, not just the computer. Although the boundaries between the three branches of the game thinking tree can be sometimes vague (an e-learning course can embrace playful design and approach some topics with a mini-educational game or a small gamified learning piece), it is important to consider the options in the light of what you, as a learning designer, want to achieve by applying game design principles. 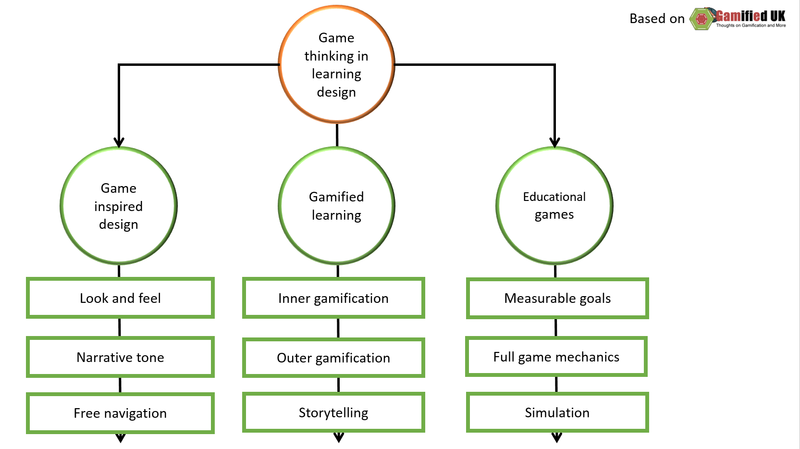 To really gamify your learning design you need to integrate it from step 1 in your thinking. It requires a change in your pedagogical approach, it’s not an add-on to your usual way of working. Throw away your conceptions and assumptions, and build the new piece from the bottom up. Additionally, I find that to create really good gamified learning and certainly to start designing educational games properly the only path is to research real game design and not rely purely on gamification literature and certainly not on the ‘tips and tricks’ widely spread on the net. ← Can we break free of slide thinking in e-learning modules?